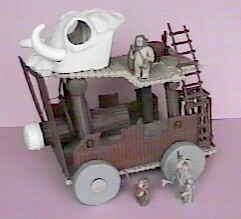 The Ewok Battle Wagon and Tatooine Skiff were the only full-sized vehicles offered in Power of the Force packaging. 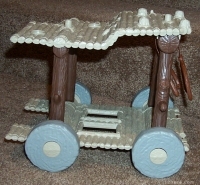 Due to declining sales in 1985 when they were released, both vehicles are relatively difficult to find now. 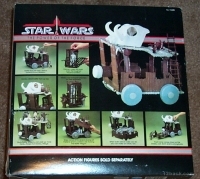 But while the Skiff has become one of the most desired of Star Wars toys, the Battle Wagon has experienced only limited appeal among collectors. 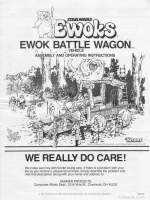 Considering the nature of this toy, it would seem to have been better suited for release as part of Kenner's cartoon series-based Ewoks line that also debuted in 1985. 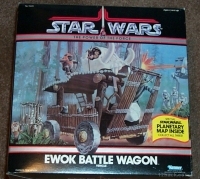 The Battle Wagon, along with the Ewok Village, Assault Catapult, and Combat Glider appear on the back of Ewoks cards. 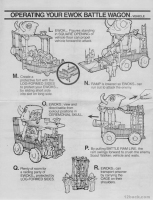 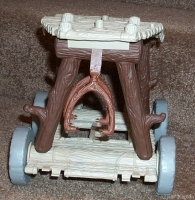 A catapult replaced the large skull on the top of the wagon. 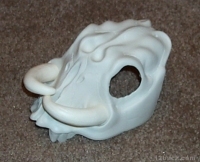 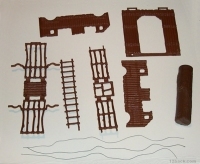 The two side pieces are removable and lock together at a 90 degree angle.